I’m a cyclist. Not of the “race ‘til it hurts, win at every cost” variety, but I do average 100 miles a week at a decent pace, and have funny tan lines and more spandex in my closet than business wear. So I figure I can call myself a cyclist. Here’s the thing about people like me. We like to view the world from two wheels. We see roads with bike lanes and want to ditch the car right then and there. Even if that road happens to be in Manhattan. Or Queens. Or Brooklyn. It was on one of my first forays to “the city” from Fingerpaint’s office in peaceful Saratoga Springs that I spotted Manhattan’s brightly painted green bike lanes and the designated lane splitting the road through Central Park. My thirst for uber-urban two-wheeled exploration began that day, as did begging colleagues to do it with me. As luck would have it, a client meeting took me to the city last Friday, which coincided nicely with the NYC Century Bike Tour two days later. So I registered, recruited a couple of brave friends, rented a bike and packed the brightest flashing lights I could find to add to it. I figured if I could be seen, I’d live to hop a direct flight back to our Phoenix office the next day. The biggest discoveries of my 55-mile trek through the boroughs? Neighborhoods within New York City’s boundaries are so unique and distinguished, yet they flow seamlessly from one to the next. Cars really aren’t trying to kill cyclists, pedestrians are. And there’s a tightly knit cycling community that is working diligently to make safe alternative transportation the norm in the region. Prospect Park in Brooklyn is every bit as pretty, diverse and active as Manhattan’s Central Park, but considerably less crowded. It may be a tad smaller, but on a bike you can still get a good climb to the top, a fast descent (with no pedestrians in your path), and a snack anywhere along the way. And it feels very, very safe. Nathan’s original hot dog stand in Coney Island is worth every minute spent waiting in line for a chili dog and cheese fries. And equally worth every calorie (another benefit to biking the boroughs—calories fuel the journey, so take them in!). 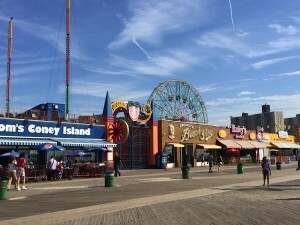 The Coney Island boardwalk really is made of boards. Wooden boards! My East Coast colleagues are smirking right now, but my West Coasters understand. You mean it’s not a concrete path through the sand? Stoplights are suggestions, not mandates. I’ll spare you from the expletives tossed my way by NYC cyclists when I stopped for the first red light in my path. This safety queen quickly adapted to the local riding style, but I’ll be happy getting back to the stop-at-reds crowd in Phoenix. Bridge crossings are narrow paths for cyclists, barely wide enough for oncoming bikes to pass. Add to that those who stop to take pics of the skyline, and it’s a bit of an obstacle course. But so worth it to move quickly between the boroughs and capture the best shots of the city and its waterways. Don’t skip the islands! Randalls and Wards Islands are beautiful, tranquil extensions to the bustle of Manhattan. The perfect place for a picnic and skyline gazing. Central Park is simply the best part of Manhattan. Go there on a bike and you’ll not want to leave. Take in an off-the-beaten-path art gallery if you can. We attended the opening of Steven and William Ladd’s Chapel at The Invisible Dog Art Center in Brooklyn. Fantastic! Eat local! I’ve dined at some of Manhattan’s best restaurants, so we enjoyed a couple in Brooklyn for this trip. Our top choices? Avlee (authentic Greek) in Carroll Gardens and The Good Fork (killer ambiance, American-Korean fusion cuisine) in Red Hook (which also has a fabulous local wine, BTW). If I’ve intrigued you enough to venture out on the bike lanes of NYC, rent a bike from Bicycle Habitat. They know the city, the shortcuts and safest routes, and they’ll give you a bike suitable for your riding style. Twenty-four hours in New York City is 144 too few to experience even a tiny fraction of its grandeur, especially from a bike seat. But it sure beats not doing it at all. So get out there and when you need a break, swing by the Fingerpaint office at 50th & 3rd in Midtown. We’ll fill up your water bottles. Michelle Olson leads Fingerpaint’s Scottsdale office and is a self-proclaimed PR nerd. 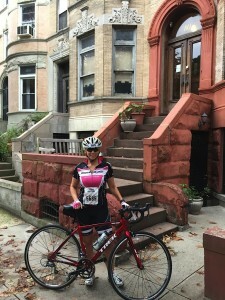 Her specialty, even more than building communications strategy and staying on top of emerging media, is her ability to seamlessly blend work with her passions for travel, learning and…cycling.